“Your mother was a hamster and your father smelt of elderberries.” – Monty Python and the Holy Grail. I used to laugh at this random insult when we would have “Grail Fridays” in college. A bunch of us would get together and sit around watching the movie and er…drinking. It just seemed like such an odd thing to say to somebody. I mean, who goes around emanating elderberries? And who even knows what elderberries smell like? When I was growing up, elderberries weren’t a feature in our household. They were growing around the places I played, I’m sure. But honestly, you don’t really know what elderberries smell like until you cook them. It’s a bit formidable looking when it’s all stacked up but it makes juicing pitted berries so easy! 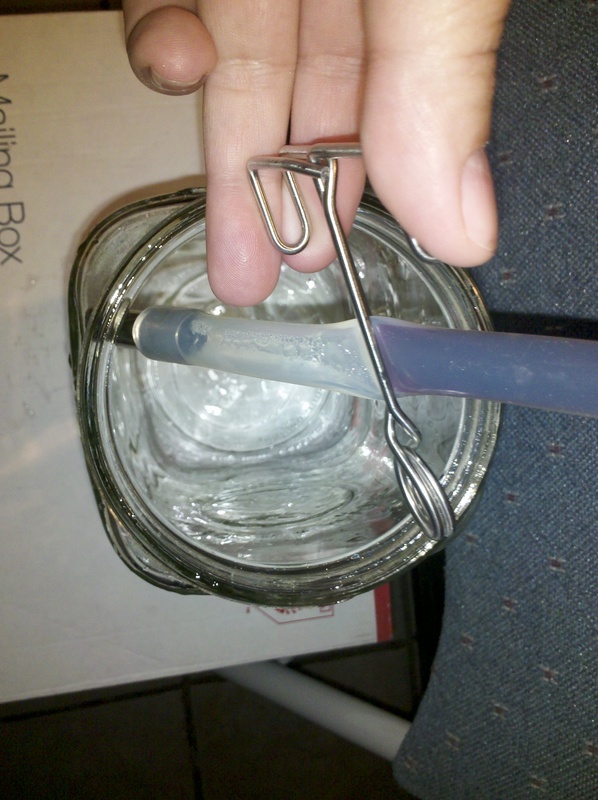 Here you can see the boiling pot (bottom) the juice catcher with the surgical grade tubing (middle) and the strainer-style container with lid on top. 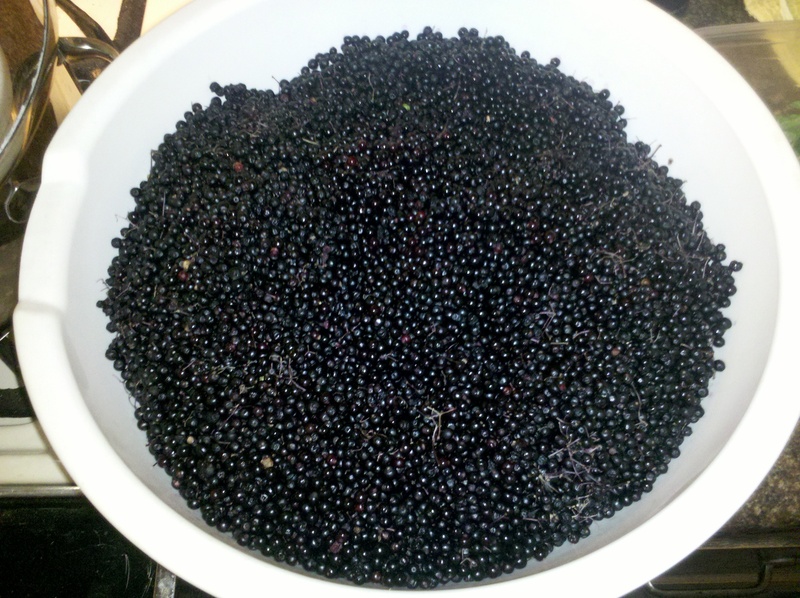 Last week I blogged about picking elderberries and introduced you to my juicer/steamer, the Mehu-Liisa. 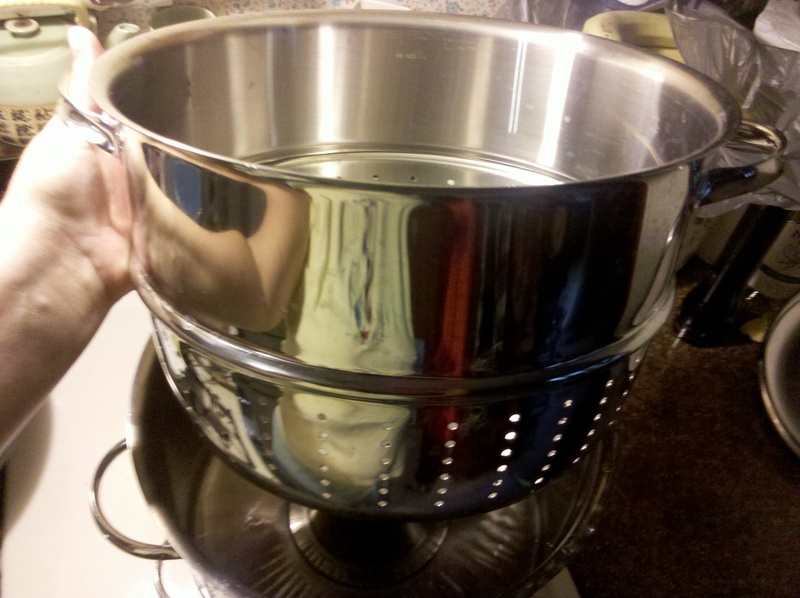 You could probably have a similar effect from a double-boiler, but this is made specifically to make the task of collecting juice from pitted berries much, much easier. Although it can be used as a roaster, I don’t cook meat in the same container I use for juicing fruits and vegetables. 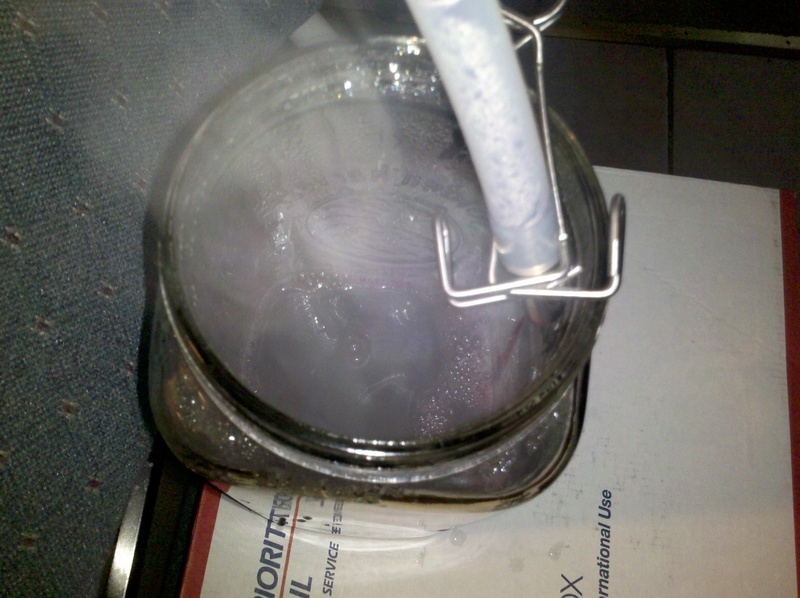 The set-up of the container is a water boiler on the bottom, a juice collection container in the middle and a strainer-style container on the top, with a lid (see photo above). I sometimes do straight elderberries in my juicer but often, since I like to play with different flavor combinations and to save time, I will combine more than one berry. 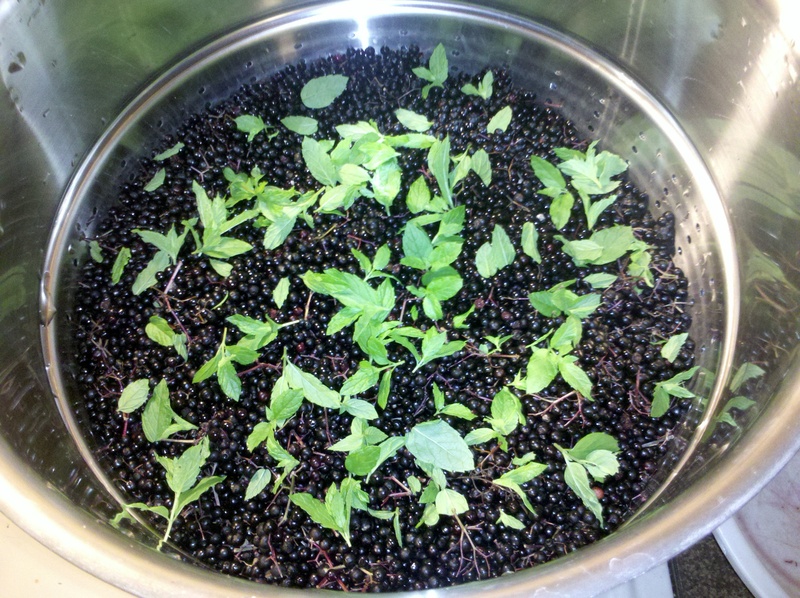 If you read the blog last week, you might remember that I told you that I would have something surprising to juice with the elderberries this time. I thought instead of other berries I would combine my elderberries with mint growing in the yard. 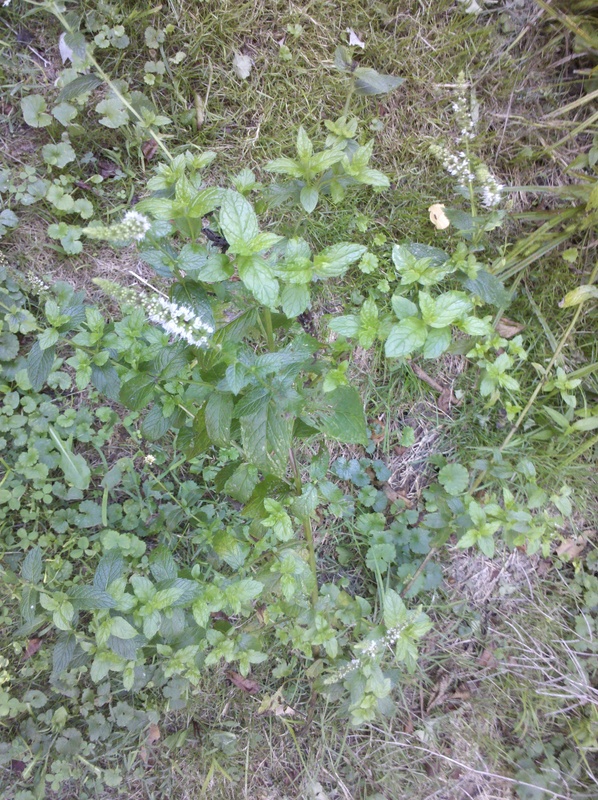 It’s the same mint I usually pick and eat as I’m walking the property, and it’s great to offset the often tart and slightly bitter taste of elderberries. Mint grows rampant on our property in Lover, PA. It’s great for eating raw or for adding to dishes or, in today’s case, steaming into elderberry juice. 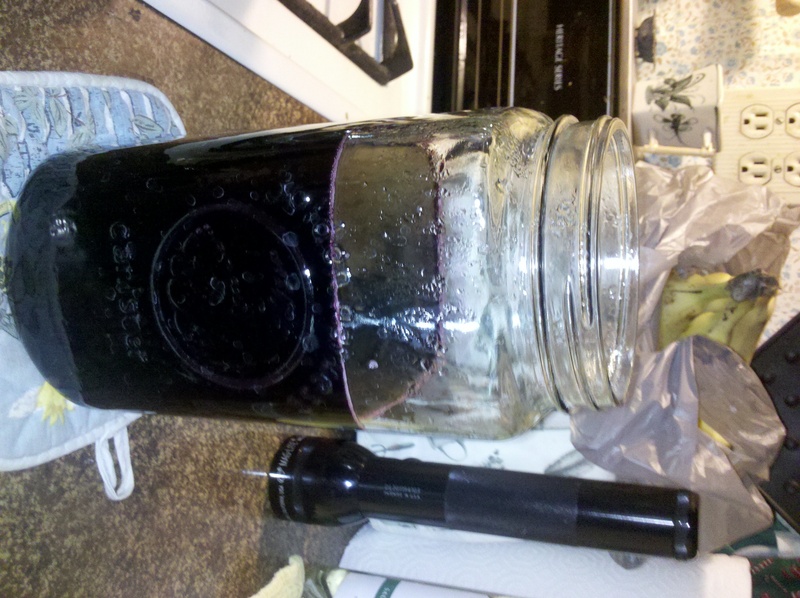 I collected just enough to offset the elderberry flavor but not enough to overpower it. I actually could have gone a lot more intensely with the mint because elderberry is that potent, but I am picky with this, too. I prefer only the small, new mint leaves because they are pure mint, no bitterness that the larger, older leaves sometimes have. 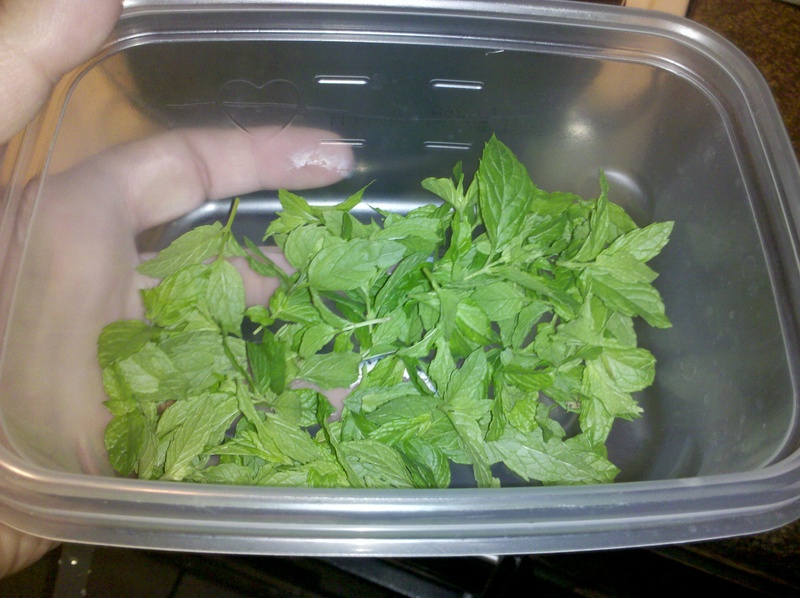 Just enough young mint leaves to add flavor but not take away from the strength of the elderberries. I pulled the elderberries from the fridge and layered the mint leaves on top. I filled the bottom pan with water and clamped off the surgical grade hose to make sure no elderberry juice could empty until I was ready to catch it. Mint leaves and elderberries ready to steam. 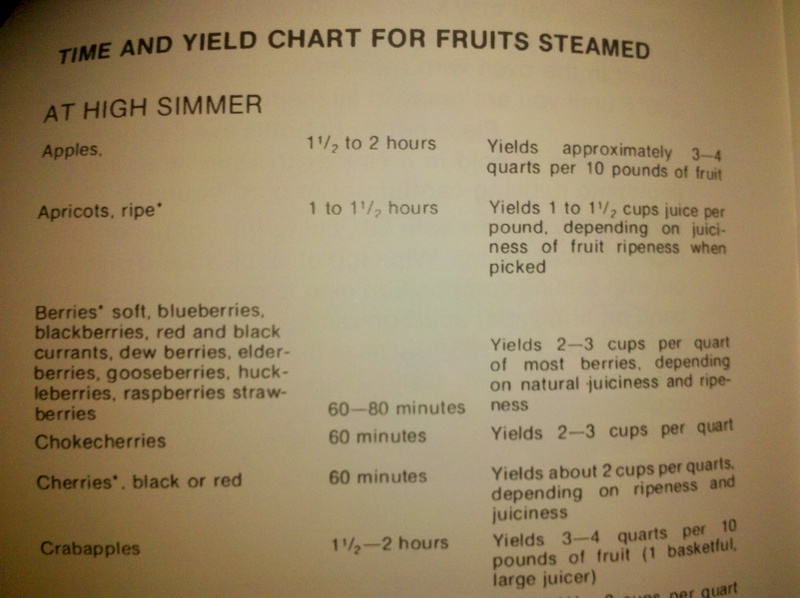 The Mehu-Liisa chart for steaming various things, such as elderberries and gooseberries. Hmmm – maybe gooseberry jelly next year? In Marla’s-an-elderberry-reeking-shortcutter terms, this means I turn my stovetop to high heat, set the timer for 60 minutes then begin to catch the first of the juice at that point, setting the timer for another 20 minutes. My rigged-up catcher for juice. 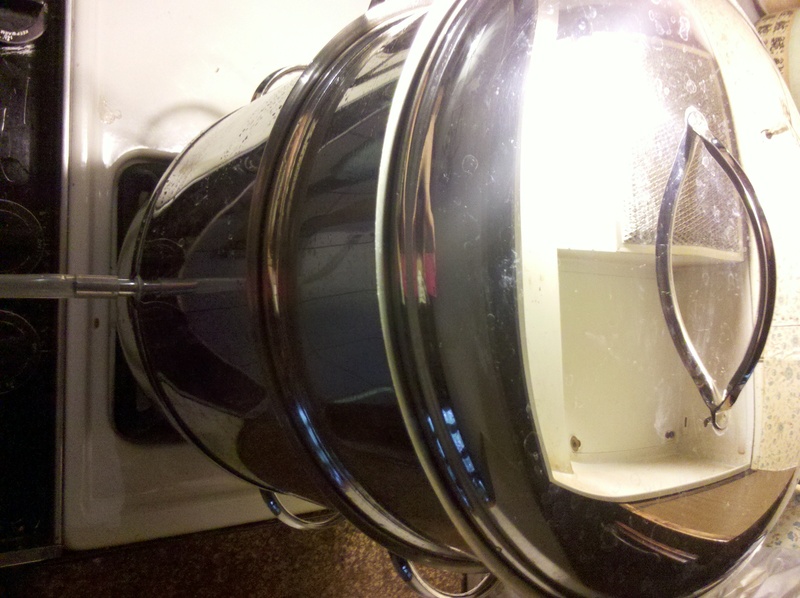 This is the only pitfall of the steamer is setting up an ideal catch for the juice. Thankfully the surgical grade tubing and clamp really make it a flexible process. After the 60 minute timer goes off, I start letting the juice flow. If, after unclamping the tube/hose, the juice is coming out steadily (not necessarily heavily, but steadily) then I set for the next 20 minutes and leave it go. Don’t lift the lid to check on the progress. You lose precious steam. You’ll learn to trust your timing and how long your water can boil without going dry. When you’re done snipping all those bunches of berries, stripping them carefully from the stems and go through the process of steaming and cleaning up, you end up with such little juice that you wonder why you ever make it in the first place. Especially considering this is all PRE-jelly making. You still have to do all your regular jelly/jam making setup and spend another couple hours prepping, making and cleaning that. You wonder why you do it, until you give somebody a jar and they really get excited, they do not remind you that you smell of elderberries, and hand you a couple empty jars from last year. 😉 You know then that you’ll complete this labor of love again next year.